The waiting is almost over! 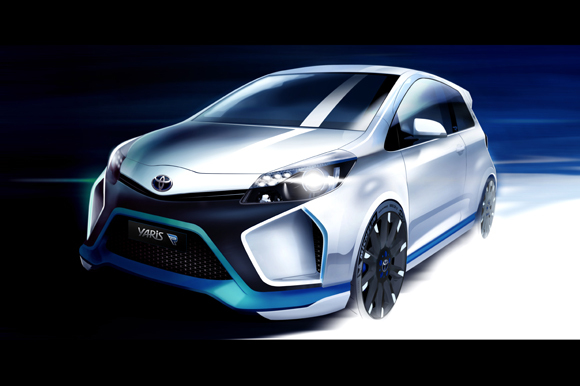 We can finally reveal more pictures and new details of the thrilling new Toyota Yaris Hybrid-R concept. Based on the the three-door Yaris, Hybrid-R features a new 1.6-litre GRE (Global Race Engine) developed by Toyota Motorsport. The 1.6-litre petrol engine is combined with two powerful electric motors that give the car intelligent all-wheel drive capability. Inspired by Toyota’s TS030 Hybrid race car, energy recovered under braking is stored in a supercapacitor, a unit that’s particularly suitable for use in a sports car thanks to its high power density and quick charge and discharge speeds. The result is a highly focused machine, designed to deliver the maximum driving pleasure, both on road and track. Created as a showcase for possible future hybrid development ideas that can deliver greater performance and driver rewards, the Toyota Yaris Hybrid-R will make its world debut at the 2013 Frankfurt Motor Show on September 10th. For more on Toyota’s plans at this event, don’t miss our show preview. I just moved from Didcot to Swindon. I can’t believe the torture I have been exposed to. There is a brand new Yaris right opposite my new home, staring at me through my lounge window. Beyond my finances I’m sad to admit – But STUNNING none the less. Thanks Duncan…although we’re sorry it can be frustrating looking at something so beautiful, it’s surely a good thing to look at each day? We greatly appreciate your comments and do let us know if you ever need to get behind the wheel of the latest Yaris, we’ll happily get one to your front door for a test drive! Is that the most beautiful car ever produced? Well it is in my eyes. My 2001 Yaris still looks and goes like new. The new Yaris Hybrid has the same heart. Amazing car.